When the developers at Crystal Dynamics rebooted the Tomb Raider series two years ago, their intentions were to reinvent Lara Croft by casting her in a vulnerable and untested role rather than as the unflappable heroine from her original adventures. With the prologue done and gone, we are now presented with a Lara exuding more confidence and flexing her spelunking muscles. This shift has caused her new story to become more derivative. 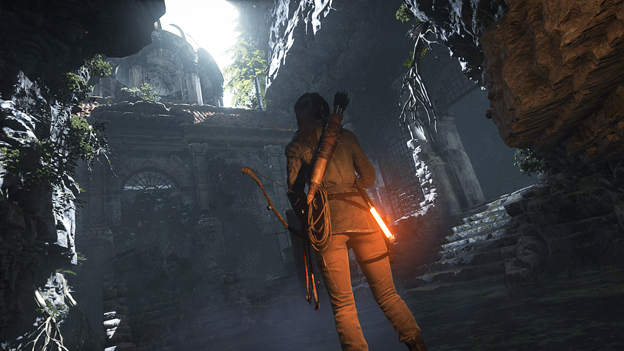 The emotional attachment to Lara in Rise of the Tomb Raider differs from the one displayed in her origin story. Instead of the sympathy we feel and the fervor for her to overcome the harsh obstacles that were cast upon her unbeknownst, now she has grown stubborn and become obsessed with following in her father's footsteps. We still root for her, but the empathy has waned. 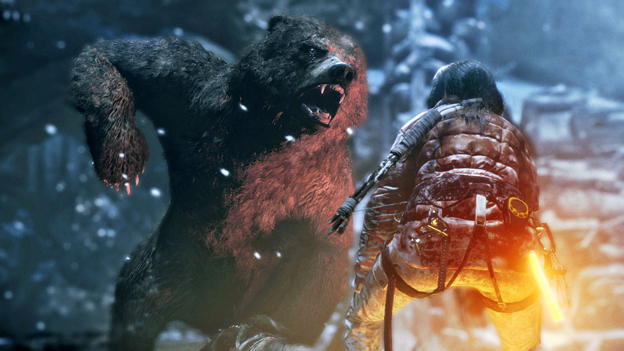 Still, Rise of the Tomb Raider spins a gripping, if not clichéd, tale. Newly established, Lara is easing herself into the whole tomb raiding career, so naturally she follows a lead that takes her to Siberia where a fanatical and well-funded sect called Trinity is searching for the same credence to a centuries old myth that could lead to the power of immortality. Abandoned Soviet installations, a group of ancestral protectors of the truth, and plenty of priceless treasures await the eager player. It hits all the marks of a high-budget blockbuster, but it's nothing we haven't already seen in Indiana Jones or played in Uncharted. Cinematics permeate the game from start to finish, and you'll find few moments where your fingers aren't poised and eyes locked on the screen in anticipation of a quick-time event. From Syria to Siberia, the action-packed, life or death situations hang on the speed of your button presses. 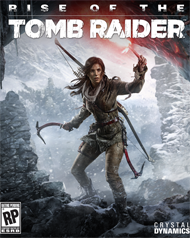 Sadly, you will be forced to watch Lara meet a grisly end many times from booby traps, wild animals, and environmental hazards. Death, however, is nothing more than a minor inconvenience in Rise of the Tomb Raider, as the game is quite liberal with checkpoints, subduing the tension even on the higher difficulty levels. Each new zone you enter looks sizeable on paper, but most areas are sectioned off and linear, keeping you from straying too far from the scripted story. At times the reins are loosened somewhat, allowing you to explore for loot caches, relics, documents, and other collectibles that build skills, provide experience, and offer historical tidbits. The game awards Lara with a "supernatural" Survival Instinct, which highlights interactable objects. Snapping branches, skinning rabbits and deer, harvesting ore with her trusty ice axe - these are just a few activities to build your inventory of materials for the game's efficient crafting system. When secure at a base camp, common and exotic materials can be expended to bolster weapon properties, fashion ammunition, and upgrade your pouches' carrying capacity. Acquiring new weapons, however, is more rigid in structure. Instead of grinding and stockpiling to craft a shotgun ahead of schedule, new weapon parts are sprinkled piecemeal in preset locations as you progress through the campaign. Fortunately, the game provides multiple avenues for dispatching Trinity grunts than simply unloading an ammo cartridge. Firing arrows and sitting in cover allows for some satisfying stealth kills. Small objects strewn about can be thrown to distract enemies. Lanterns can be tossed onto flammable materials to incinerate a group. Rise of the Tomb Raider allows you to tackle enemies and obstacles according to your play style, with a nice variety of abilities to choose from as you gain levels.